New York City Unveils AIDS Memorial [VIDEO] - Joe.My.God. A special tribute was held in honor of World AIDS Day to the victims who died of the disease in New York City. The AIDS Memorial Park at Saint Vincent’s Triangle in Greenwich Village was dedicated on Thursday. The project was launched in 2011 to remember the men, women and children who have died from AIDS in the five boroughs. The memorial is located across the street from the old Saint Vincent’s Hospital, which was once home to the city’s first and largest AIDS ward. The dedication ceremony was one of many events being held across the globe aimed at increasing AIDS awareness. As 1010 WINS’ Juliet Papa reported, thousands turned out for the event. “It’s so good that you are here, it’s so important that we pay homage and tribute to those we’ve lost, and those who are still fighting,” Broadway performer Lillias White told the crowd. 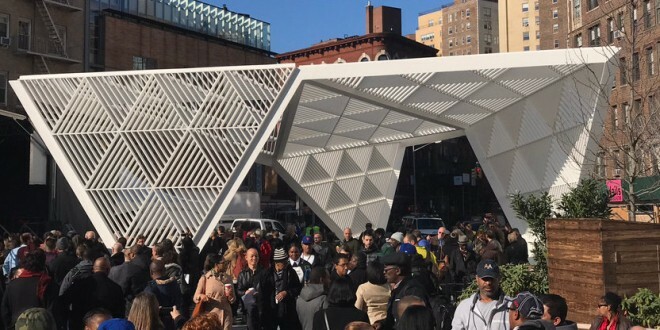 The dedication ceremony also featured a reading of the 100,000 New Yorkers names who have died from the disease, WCBS-880’s Marla Diamond reported. In conjunction with the ceremony, Gov. Andrew Cuomo announced a series of initiatives to end the AIDS epidemic in the state. The governor signed legislation that will “eliminate barriers to testing, increase access to treatment, advance cutting-edge research and expand access to HIV services for youth,” his office said in a statement.